A cause for celebration: our small town has, for the first time, a winter farmers’ market. We can get lovely cold-storage vegetables, home-canned goods, breads, and locally raised meats. We’ve been thrilled to have access to beautiful organic chickens. I’ve made a lot of soup with these beautiful birds. The stock from them is glorious: so rich it gels when chilled. While Luke was home from college over winter break, we went through batches of wild rice soup, classic chicken soup, and corn chowder. I’d found a precious source for San Marzano tomatoes (a feat in central Wisconsin) and wanted to see what all the fuss was about. San Marzano canned tomatoes are supposed to be the very best, and indeed they were much closer to fresh summer tomatoes, with much more sweetness than most canned tomatoes have. Organic chickens have more flavor than mass-produced chickens do, so they can hold up to the tomatoes just fine. The secret ingredient, though, is the parmesan rind. 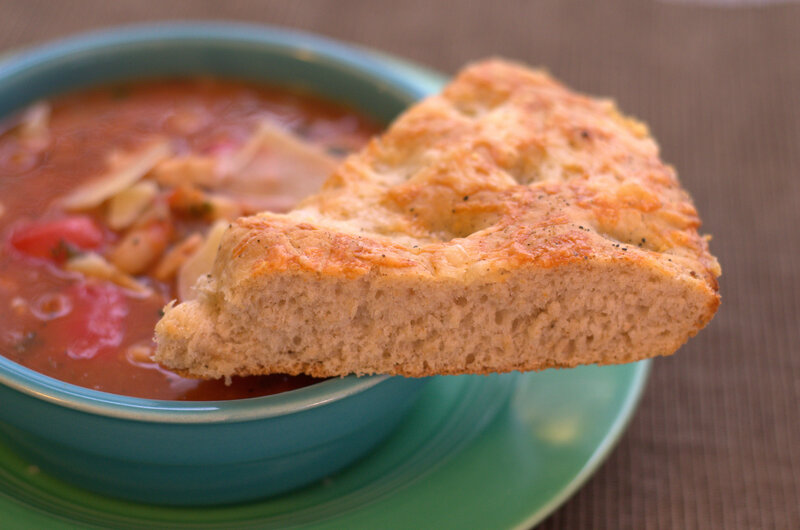 Save those hard end bits (I have them in a bag in the freezer) and toss one in your stockpot next time you’re making a hearty soup. 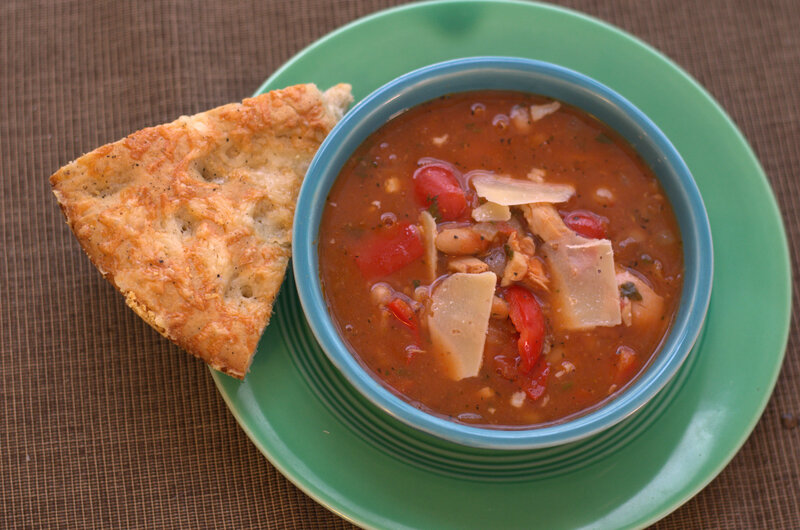 The parmesan won’t completely dissolve, but it adds a rich depth of flavor, just as bones simmered in stock do. The result is just what I was hoping for — healthy as all get-out, but hearty, rich, and satisfying. 1 small rind of Parmesan, 2-3 oz. Sauté the onion and garlic in the oil in a stockpot over medium heat for about 5 minutes until the onion is tender. Add the bell pepper, chile (if using), dried basil, Aleppo, and a hefty pinch each of salt and pepper. Sauté for another 10 minutes or so, until the peppers are tender. Add the stock. If you’re using whole tomatoes, squeeze them through your fingers over the pot to crush them, and stir in the tomato liquid. Drop in the parmesan rind. Give the soup a good stir and taste for seasoning; adjust as necessary, remembering that the parmesan will add some salt. Bring to a boil, reduce heat to low, and simmer for about 20 minutes. Stir in the beans and chicken. Simmer another 10 minutes to blend the flavors. Fish out and discard the parmesan rind before serving. Stir in the parsley and serve with shaved parmesan. A mild Pinterest addiction can really come in handy. My current hairstyle, our recently painted beet-red front door, the necklace I made and am wearing right now — all courtesy of ideas found on Pinterest. Mostly I pin recipes. One-Hour Skillet Focaccia, from CrunchyCreamySweet, was a big success. I’ve made it several times now. Each variation has been easy, delicious, and remarkably fast. I can’t quite make it in 60 minutes, but it’s not much more than that. I’m always trying to make recipes healthier without sacrificing flavor. This bread needs the two tablespoons of olive oil in the dough; otherwise it’s dry. Since I was using cheese on top, I skipped the butter and used only a touch more oil to aid in browning. I also found that, for us at least, a bit more salt was welcome. I’ve made this with parmesan instead of cheddar, and with a sprinkle of caramelized shallots atop. The black pepper adds a subtle heat, but can be left off. It’s wonderful warm out of the oven, but still great at room temperature. Like most homemade (and therefore preservative-free) breads, it’s best eaten the day it’s made. If you do manage to have leftovers, stale focaccia makes a mean strata. Crisp, cheesy, warm bread in just over an hour. What’s not to like? Place the warm water, honey, and yeast in the bowl of a stand mixer and stir to dissolve. Let it sit for a few minutes while you measure the rest of your ingredients; it should start to foam up. Heat the oven to 220 degrees. Shut it off when it reaches temperature, but leave the oven door closed. Add 1 cup of the all-purpose flour and the salt and mix at medium speed with the dough hook until well incorporated (about 2 minutes), scraping the sides now and then. Add 2 tbs. of the the oil and mix for another minute or so until it’s incorporated, then add the whole wheat flour and 1/4 cup of the remaining all-purpose flour. Mix on medium speed until all the flour is combined in; add more flour if necessary until the dough starts to pull away from the sides. Mix for 3-4 minutes longer until the dough is smooth. It will be soft and slightly sticky. Lightly oil a 10- or 11-inch cast iron skillet. Stretch the dough into a disk (as if you were making pizza crust). Place it in the skillet and gently stretch again until the dough evenly covers the bottom of the pan and rises just slightly up the sides. Cover the pan with a clean dish towel and place in the warmed oven for 20 minutes. After the 20-minute rising period is over, take the pan out of the oven. Increase the oven temperature to 450 degrees F. Uncover your pan and gently spread the remaining teaspoon of oil evenly over the dough. Poke the tips of your fingers in the dough to create dimples. Sprinkle with the cheddar and a light dusting of black pepper (about 1/4 tsp.). Re-cover the pan until the oven reaches temperature. Put the focaccia in the oven and immediately reduce the heat to 425. Bake the focaccia, uncovered, for about 20 minutes until golden. Cool in the pan for 10 minutes, then remove the focaccia from the pan and cool on a rack. It’s great to have a few stellar appetizers you can whip up at the last minute from the stash in your pantry and fridge, especially at this time of year. It’s also terrific to have a few tempting and healthy apps in your repertoire. This dip is both. 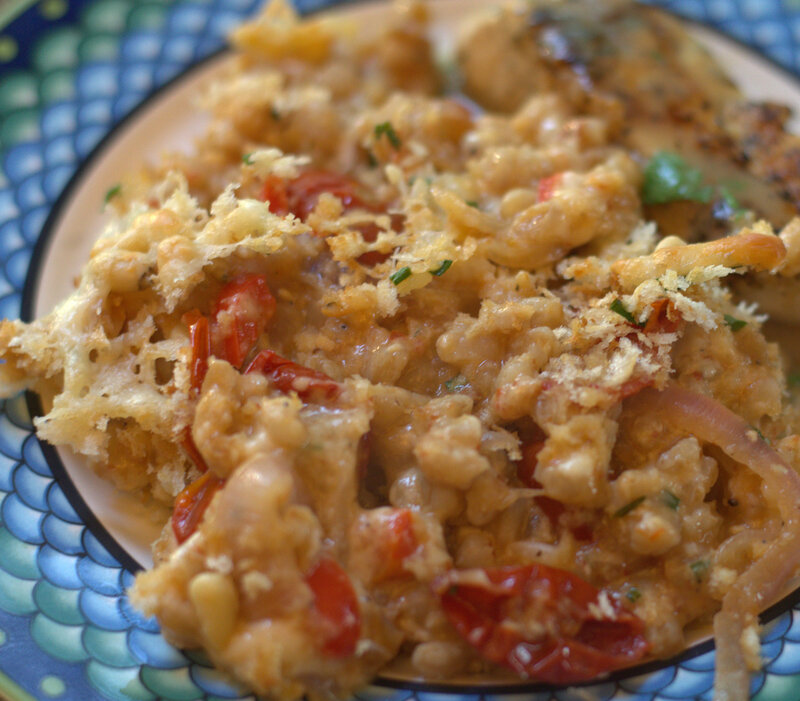 It’s similar to hummus, but uses tender white beans instead of chickpeas, and parmesan instead of tahini. Like most dips, it’s tasty right away but benefits from a few hours in the fridge, to get those flavors melding. There’s not a lot of parmesan, just enough to provide a salty hint to the mild beans. The lemon brightens the flavors and balances the creamy texture. A few minutes in the food processor, and you have a dish ready to go. Chef Art Smith once commented on Top Chef that if your food is bland or needs seasoning, start with a little acid first — then salt. I’ve never forgotten that. Now I try a few drops of lemon juice, vinegar or wine before I add extra salt. Give it a shot and let me know what you think. In the summer, add a few tablespoons of fresh herbs. I used dried herbs because 1) it’s full-on winter here, and 2) we do not have a single window that gets direct sun, so an indoor herb garden is but a dream. The dip is still darned yummy. I’ve served it with crisp, sweet carrots (the best I’ve ever had, from Gravel Road Farm), with homemade pita chips, and with pretzel sticks. It’s a creamy, light spread on sandwiches. On a cutting board, sprinkle the minced garlic with a pinch or two of salt. Mash the salt into the garlic with the flat of a knife until it becomes a coarse purée. Pour the beans into a food processor. Add the garlic, a few grinds of pepper, 2 tbs. of the lemon juice, the scallions, oil, and herbs. Blend, stopping to scrape down the sides now and then, for 2 full minutes. Taste, and adjust the seasoning with more lemon and salt, if necessary. Add the parmesan and pulse to combine. It’s tasty right away, but better if you can let it sit in the fridge for a few hours to allow the flavors to meld. 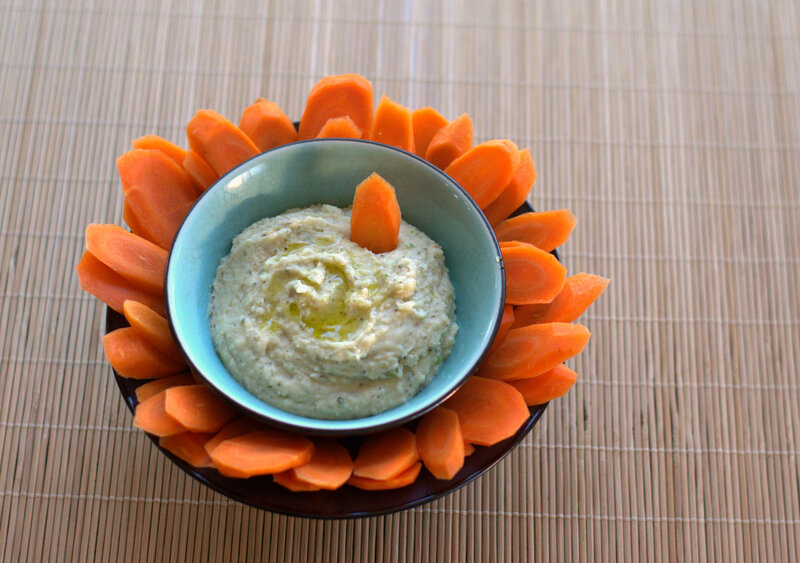 Serve with vegetables, pita chips, crackers, or tortilla chips; use instead of mayo on a sandwich. It is once again time for the Great Food Blogger Cookie Swap — the third annual GFBCS, in fact. This is the brainchild of the wonderful bloggers at Love & Olive Oil and The Little Kitchen. Each blogger participant makes a batch of cookies, and sends a dozen each to three other bloggers. In return, we receive cookies from three other bloggers. Our hosts manage all the details (and there are many, especially considering that roughly 600 bloggers participate each year). We also each donate to Cookies for Kids’ Cancer, an organization that raises money toward a cure for pediatric cancer. We raised nearly $14,000 this year! I received buttery almond sugar cookies from Spoonful of Flavor, delicate pinwheels from White Lights on Wednesday, and beautiful lemon sugar cookies with royal icing and lustre paint from Stirring Things Up. I was in a quandary about what to make. I lamented the fact that I’d already posted about my very favorite cookies — my version of my family’s molasses cookies. (one of the Swap rules is that you only post a new-to-you recipe.) Then I remembered the glorious moment when Luke and I slathered these amazing cookies with Nutella. The angels sang, I swear. So, working on the assumption that everything is better with chocolate, I began fiddling with the original recipe, starting with replacing some of the flour with unsweetened cocoa powder. They were tasty right away, but it took a few practice rounds to get the balance just right. My son and his college buddies were willing test cases for the first batch; my library pals offered helpful tips on the second. The final version lightens up on the cloves, then replaces the heat with finely chopped dark chocolate with chiles. For less heat, you can certainly use plain dark chocolate. 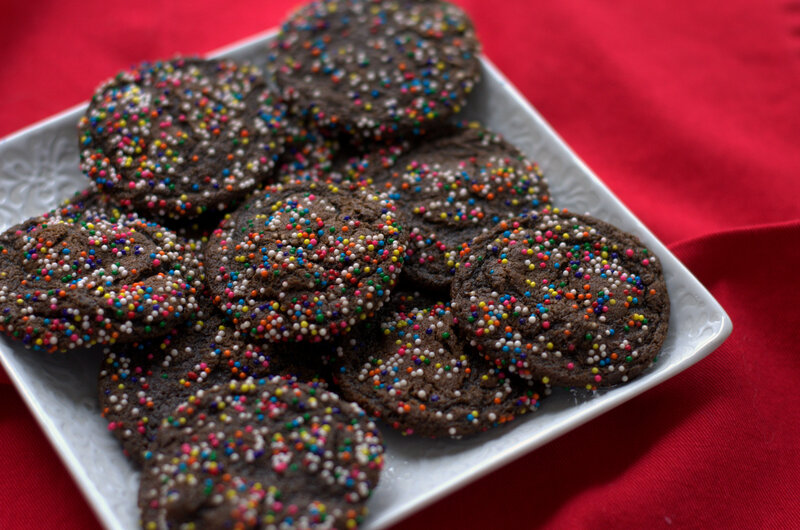 Since the ingredients include molasses, chocolate, and cocoa, the resulting cookies are nearly black. Multicolored sprinkles took them from gloomy to festive, and added a fun crunch. Line a large cookie sheet with parchment paper. In a small bowl, whisk together the flour, cocoa, baking soda, salt and spices. In a large bowl, place the butter, shortening and brown sugar. Beat together just until incorporated, about 30 seconds. Add the egg and beat just until incorporated. Stir in the molasses. Add the dry ingredients a third at a time, mixing just until incorporated. Add the chopped chocolate. Refrigerate the dough for at least an hour until firm. Heat the oven to 400 degrees F. Pour the sprinkles into a shallow bowl. Scoop a heaping teaspoonful of dough and roll in your palms to a ball. It should be about the size of a fresh cherry. Drop in the sprinkles and roll to cover completely. Place on the parchment-covered cookie sheet. Continue with the dough, spacing the balls about 2 inches apart –they will spread. Bake for about 7 minutes until the tops are slightly cracked. Aim to slightly underbake–they will continue to cook on the hot cookie sheet. Let them rest for 1 minute, then move the cookies to a rack to cool completely. Note: This is a post I started in early November. Now that my breast cancer treatment is done, I’m getting back in the habit of regular blogging. Back to work, back to life, back — finally — to blogging. I feel positive, energetic, and remarkably flabby from three months away from the gym. I’m aiming for a lifestyle that is healthy and pleasurable at the same time. More exercise helps. I still want food to be delicious, but I’m trying to eat a little less of it. Incorporating more vegetables (which I love) and fruit also helps. My colleague and friend Patsy had a bumper crop of apples this fall, and was generous with them. I sent some off with Tom when he went to visit Luke in college; Luke loves fresh fruit (especially apples). I had several fruit-and-cheddar plates as light lunches. And I made a cake. This cake is mostly fruit, with just enough batter to hold the apples together. It manages to be both moist and light at the same time, with lovely caramel tones from the brown sugar. The cinnamon sugar topping creates a delicate, crackly crust. Once again, I have my mom to thank (she’s often my source for baked goods). I’m not sure where she found the original recipe, but it’s been tweaked along the way. I use less sugar than Mom does, and brown sugar instead of white. We both like the apples in larger, bite-sized chunks, while others prefer the fruit to be finely chopped or even shredded. I like the additional crunch of walnuts (or pecans), but you can leave them out. 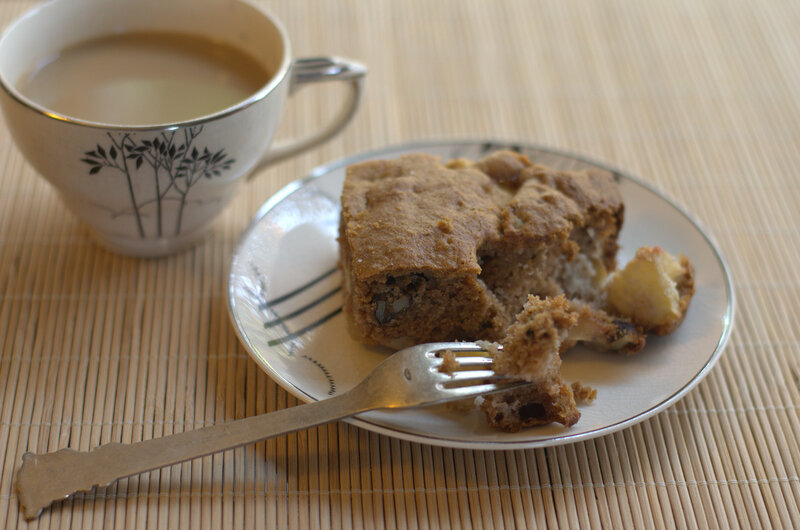 I’ve added raisins at times, and made the cake with pears instead of apples. I’ve even made a version of this cake with carrots and apples. The cake is sweet enough for dessert, but with all that fruit and the whole wheat flour, you can feel relatively virtuous eating it for breakfast or a snack. Grease and flour an 11×7-inch pan. * In a large bowl, toss the apple chunks with the brown sugar. (I just used the quart measuring cup that I measured the apples in.) Set aside. In a small bowl, stir together the all-purpose and whole wheat flours, baking soda, salt, cinnamon, and cloves. In another large bowl, whisk together the eggs, oil and vanilla. Stir about a third of the dry mixture into the egg mixture, just until combined. Stir in half the apples and sugar. Repeat with another third of the dry, then the rest of the apples, then the remaining dry ingredients. Fold in the walnuts. The batter will be nearly as thick as cookie dough. That’s fine: the apples will release a lot of liquid when the cake bakes. Scrape the batter into the prepared pan. In a tiny bowl, stir together the white sugar and cinnamon for the topping if using, and sprinkle over the batter. Bake for 30-35 minutes until a toothpick inserted in the center of the cake comes out with moist crumbs clinging, but not raw batter. *If you choose to make this cake in a 9-inch square pan, bake for about 50 minutes. If you use a 9×13-inch pan, start checking after 20 minutes. A few weeks ago, on a whim (and because Deb Perelman never steers me wrong), I tried Smitten Kitchen’s Slow-Roasted Tomatoes. They’re drier than the oven-roasted tomatoes I’d made before, but more moist than sun-dried tomatoes. The flavor is sweet, but still with an underlying acidic tang. I was sold. Tom doesn’t usually care for either sun-dried tomatoes or cooked tomatoes in general, unless they’re puréed into a sauce. But he grabbed one off the cookie sheet where they were cooling, and was an instant fan. We’ve folded them with shredded chicken and cheese in tortillas for a quick lunch. We tossed them with pasta and sautéed bell peppers for a dinner that was mighty tasty. I made batch after batch, stuffed the extras in jars, drizzled them with olive oil, and popped them in the freezer. Deb roasts hers at 225 degrees F for three hours. My oven must be slow, because my first batch took over 4 hours. I found that two hours at 300 degrees F was perfect, for my oven anyway. For dinner tonight, I once again used Smitten Kitchen as inspiration (this happens quite frequently), but this time more as a jumping-off point. My creation is a hybrid of the Wild Rice Gratin with Kale, Caramelized Onions and Baby Swiss from The Smitten Kitchen Cookbook, and One-Pan Farro with Tomatoes, from her blog. 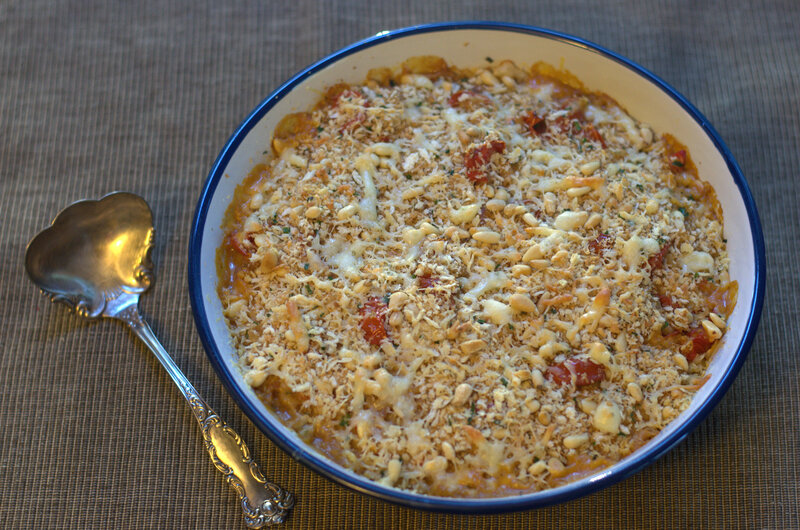 My version has the cheesy creaminess and golden, crunchy topping of the gratin, but the nutty chewiness of farro and tangy sweetness of the roasted tomatoes. I also added a handful of toasted pine nuts to the crunchy panko topping as a favor to Tom. He adores pine nuts, and I forget to use them. They added terrific flavor that echoed the nuttiness of the farro. I won’t leave them out ever again. For the cheese that mingles with the farro and the tomatoes and creates a sauce, I used a mixture of fontina and a soft, mild cheese with flecks of green onion that we’d gotten locally. (We do live in the Cheese State, after all.) I’d recommend any creamy, mild melting cheese. Farro is an ancient form of wheat. It is available whole-grain, semi-pearled and pearled (pearling removes the outer bran layer). The cooking times vary greatly; pearled farro cooks in as little as 15 minutes, while whole-grain can take an hour. Your package might not indicate the level of pearled-ness (so to speak), but you can rely on cooking times. The farro from the organic section of my grocery store provides no clue at all; turns out it’s whole-grain. I soak it in hot water for half an hour, then cook right in that same water with a little salt for about 45 minutes. It freezes well, so cook a big potful, then pack it in 2-cup batches, which fit nicely in pint-sized freezer bags. Flatten, close, then freeze. The pan-seared chicken breasts were ignored tonight. Tom and I dove into that creamy, chewy, cheesy, tangy, nutty gratin with the crisp crust over and over again, saying “Just one more bite…” We’ll be fighting over the meager leftovers tomorrow for lunch. Quick health update: I have 8 more radiation treatments left, and am feeling … okay. Essentially, it’s like having a bad sunburn in a very sensitive area. My energy level is lower (but not too low to avoid the kitchen, obviously). In less than two weeks, I move from breast cancer treatment phase to recovery. I’m thankful every day that my tumor was slow-growing, and caught so early. I’m also blessed with great friends and a loving family. All is good. Toast the pine nuts lightly in a dry medium skillet over medium heat. Watch carefully: they go from pale gold to burnt very quickly. Set aside to cool. Add the butter to the skillet, then the panko once the butter is melted. Season with a pinch of salt and a few grinds of pepper. Toast, stirring constantly, until light golden. This will only take a few minutes, so watch carefully. Set aside to cool with the pine nuts. Add olive oil to the skillet along with the onions and thyme. Season lightly with salt and pepper and cook until they’re tender and browned in spots, about 15 minutes. Add the stock to the pan and stir well to scrape up the browned bits. Mash the roasted garlic into the liquid. Add the farro and cook for a minute, till the farro is warmed through. Lightly grease a small casserole dish (I used a 10-inch pie pan). Add 1 cup of the grated cheese to the faro mixture. Scrape into the casserole dish. Sprinkle the reserved panko and pine nuts on top. Sprinkle the remaining cheese over all. Bake for about 20 minutes, until the dish is bubbly and browned on top. Preheat the oven to 300 degrees F. Halve the tomatoes (lengthwise for grape or Roma tomatoes). Lay them close together on a parchment-lined baking sheet. Nestle garlic cloves among the tomatoes. Drizzle lightly with olive oil. Sprinkle lightly with salt and pepper, and with thyme if using. Roast in the oven for about 2 hours, until the tomatoes are shriveled and moist, not juicy but not completely dried either. Store for several days well-covered in the fridge, or freeze in an airtight container. Recipe doubles easily. When considering what to make for dinner these days, I’m building meals around vegetables. My peppers, chiles, and tomatoes are all producing madly. I do want to roast some of the tomatoes to stash in the freezer, but for now we’re just eating them fresh off the vine. This tart is a balance of decadence and virtue. The puff pastry, sinfully buttery, is piled high with a rainbow of vegetables. 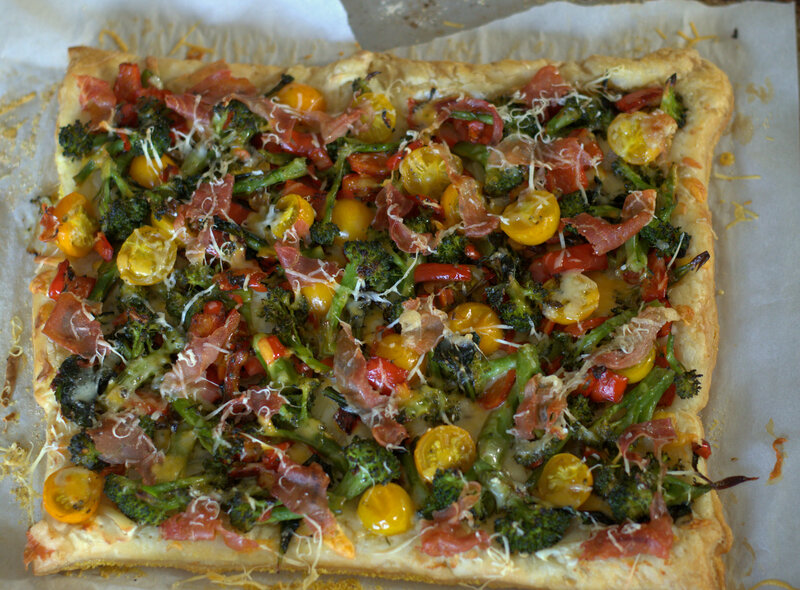 As a nod to my meat-loving menfolk, there are a few shreds of salty prosciutto; underneath is a touch of sharp white cheddar — not enough to overwhelm the freshness of the tomatoes and broccoli, but just enough to give the tart substance. Taking a few minutes to pre-cook the broccoli, onions, and peppers ensures that they are the perfect texture when the tart is finished. You can cook the veg while the pastry par-bakes, to save a little time. The acid of the tomatoes balances nicely with the rich crust. The transparently thin layer of cream cheese is just enough to keep the tart from being dry. You could easily substitute parmesan for the cheddar; in fact, the second time, I used cheddar beneath the vegetables and parmesan on top. Leave off the prosciutto for a vegetarian version; try substituting calamata olives for that salty hit. We liked this so much that we had it twice in one week, and would gladly have it again right away. I’d also cut it in small squares and serve it as a summer appetizer. Heat the oven to 400 degrees F. Steam the broccoli for about 5 minutes until just tender. While the broccoli steams, sauté the onion and bell pepper in olive oil over medium-high heat until just tender. When the broccoli is done, add it to the pan with the pepper. Season with salt and pepper, and stir in the basil and cherry tomatoes. Set aside off heat. Lightly roll out the puff pastry on a floured surface till it’s slightly larger. Place on a parchment-lined cookie sheet. Using a fork, prick the dough all over, leaving a 1/2-inch edge. Bake for 8-10 minutes until just barely cooked and not at all browned. Remove from the oven, but leave the heat on. Spread the hot pastry with a very thin layer of cream cheese. Sprinkle with about 3/4 cup of the cheddar. Scatter the vegetables over the cheese, then tear the prosciutto into small pieces and add them over the vegetables. Sprinkle with the rest of the cheddar. Bake for another 20 minutes until the pastry is golden and the cheese is melted. Enjoy hot or at room temperature.